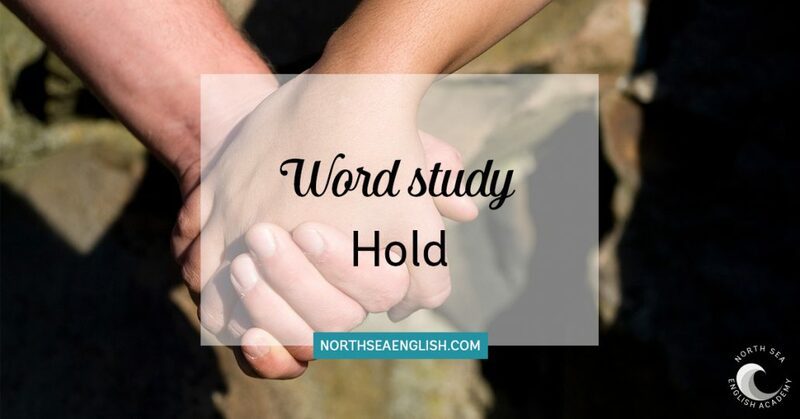 The word HOLD can be used in different contexts and assume various meanings. See some of those contexts in the list below. To have and keep in one’s grasp: The dictator held the reins tightly. To aim or direct, to point: The firefighter held a hose on the source of the fire. To keep from falling or moving; support: Charles used a nail but it was too small to hold the large mirror. To sustain the pressure of: The old bridge can’t hold much weight. To keep from departing or getting away: Hold the bus! Hold the dog until I find the leash. To keep in custody: The police held the suspect 24 hours for questioning. To retain (one’s attention or interest): Televised sports can’t hold my interest. To avoid letting out or expelling: The swimmer held her breath while underwater. To have as a chief characteristic or quality: The film holds many surprises. To have in store: Let’s see what the future holds for her young daughters. To have and maintain in one’s possession: Her family holds a great deal of property. Too have as a responsibility or privilege: Jim held the governorship for six years. To have in recognition of achievement or superiority: My brother holds the record for the one-mile race. To maintain control over: Thieves held the stolen painting for ransom. To maintain occupation by force: Protesters held the embassy for a week. To maintain a given condition: The storyteller held the crowd spellbound. To impose control or restraint: She held her temper. To reserve or keep back from use: Please hold two tickets for us. To defer the immediate handling of: The receptionist held all calls during the meeting. get (a) hold of to come into possession of. Where can I get hold of a copy of this book? hold a candle to to compare favourably with The new version doesn’t hold a candle to its original. hold up one’s end to fulfil one’s part of an agreement; do one’s share. Are you going to hold up your end of the bargain? hold one’s own maintain one’s position and be in control of a situation; be sufficiently competent in a certain situation He can hold his own in a fight. hold out on (someone) to withhold something from (someone) Don’t hold out on me; start telling the truth! hold (someone’s) feet to the fire to pressure (someone) to consent to or undertake something. I think reporters really should hold the president’s feet to the fire about this issue. hold the line to maintain the existing position The bank had to hold the line on salary increases. hold sway to have a controlling influence; dominate Ten years after she correctly predicted the crash, she still holds sway among stock brokers. hold water to stand up to critical examination. Your explanation doesn’t hold water. on hold keep a state of temporary interruption without severing a telephone connection. The credit card representative put me on hold for 10 minutes. Phrasal verbs with the word HOLD. hold to hold to something: to do what you have promised or decided; hold someone to something: to make someone do what they have promised or decided. Fill in the blank with the correct phrasal verb from the list above. Don’t hold _______ me now. Tell me where you were last night. It’s hard to hold _______ a job in uncertain economic times. She doesn’t hold _______ people living together before they are married. Jane is holding ______ about capitalism’s benefit again. What a bore! We had to hold ______ buying a new house this year as John lost his job. The play got held ______ for the third straight week. Hold ______ your hands. I have a surprise for you. We were held _______ in the city center by a huge traffic jam. It’s a bad habit. Don’t hold it _________ me. He tried to hold _______ his tears while watching the sad movie but couldn’t. Hold ______! I’ll be ready in a minute. Don’t hold out on me now. Tell me where you were last night. It’s hard to hold down a job in uncertain economic times. She doesn’t hold with people living together before they are married. Jane is holding forth about capitalism’s benefit again. What a bore! We had to hold out on buying a new house this year as John lost his job. The play got held over for the third straight week. Hold out your hands. I have a surprise for you. We were held up in the city center by a huge traffic jam. It’s a bad habit. Don’t hold it against me. He tried to hold back his tears while watching the sad movie but couldn’t. Hold on! I’ll be ready in a minute.